Clarks Bronto Step Inf is a boys school shoe from Clarks' Stomposaurus range. 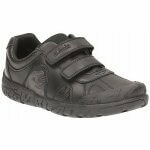 It features a leather upper with a protective rubber bumper which helps to protect the front of the shoe which makes these school shoes great for running around the playground in. 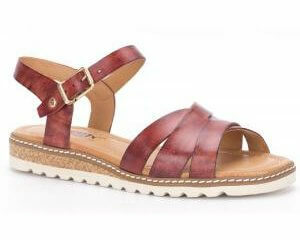 The padded collar adds comfort to the shoes, making a great all day wear. A double riptape fastening allows for easy on and off while still providing a secure fit. Agion Antibacterial linings helps to keep feet fresh during those long school days. Dinosaur characters add fun to these school shoes. Available in sizes 7-8.5 in fittings G and H.